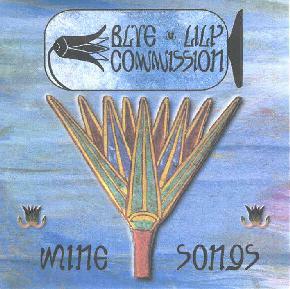 Blue Lily Commission - "Wine Songs"
Blue Lily Commission is the latest project from musician and sci fi novelist Steve Palmer who also heads up the band Mooch. According to the promo sheet, Palmer created Blue Lily Commission to release more uptempo music drawing on influences including trance, classic German electronica, and the ethnic music of North Africa, the Middle East, and India. Like Mooch, the music is primarily electronic but also includes saz, bouzuki, flutes, and a variety of percussion. The music on Wine Songs is spiritually uplifting, yet by NO means in a fluffy New Age manner. The disc opens with "Locust Swarm" on which we're introduced to syncopated synth patterns, but also a strong drifting quality that recalls Tangerine Dream and even Ash Ra Tempel. "Harp" includes a similar combination of synth patterns, but a prominent keyboard melody takes the lead with a spacey Egyptian feel. I really liked the keyboard sound on this tune that is both pulsating and orchestral. The combined orchestral and more mechanically patterned synths make for a good contrast that works well together. The saz also crops up intermittently to give an added ethnic boost to the music. "Inundation" is a quietly floating piece that combines droning and patterned synth lines with various percussion instruments. "The Goddess Nekhebit" is similar but with lots of competing synth patterns, percussion bits, and sounds. A bit like Shadowfax. "Scarab" is a standout track with tribal percussion and wailing Rick Wright styled keyboards. "Lilyhead" is similar, but the percussion is more light and trippy, and the keys have a more lush orchestral quality. And "Boat Of The Goddess Maat" is like "Lilyhead" but combines a spiritual horn call with a playful synth pattern and percussion, and some cool Ash Ra Tempel guitar to go with the electronics. Fans of Tangerine Dream and electronic Ash Ra Tempel who like an ethnic flavor will enjoy Blue Lily Commission, as will Shadowfax fans who enjoy ambient electronic music. Also, last issue I reviewed Don Falcone's latest Spaceship Eyes and Quiet Celebration releases, and with these fresh in my mind and seeing on Don's web site that a collaboration between himself and Palmer (Spaceship Mooch) is in the works, the similarities in the two musician's interests (particularly Blue Lily Commission and Quiet Celebration) are most apparent on this disc. I'll look forward to hearing the results of Spaceship Mooch. You can visit the Blue Lily Commission web site. CLICK HERE to read the review of the most recent Mooch CD that appeared in Aural Innovations.